CueServer is a complete lighting playback and integration processor, featuring advanced DMX lighting control, sophisticated event scripting and robust I/O capabilities combined in a tiny web-based device. Great for both architectural and entertainment lighting control projects, CueServer provides an unprecedented level of control and customization in an easy-to-use package. 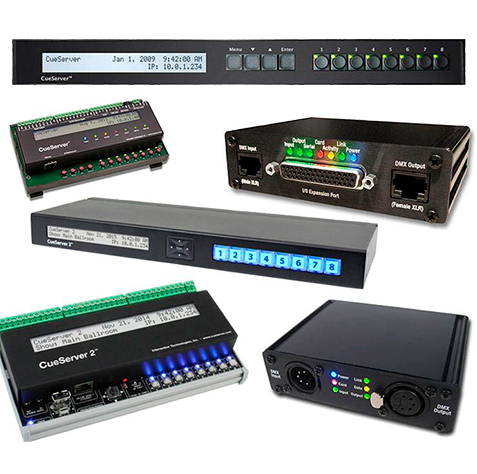 CueServer includes a built-in web server that provides access to a full complement of lighting controls, show programming and playback features without the need for special software or an Internet connection. Apps for iPhone and iPad are available for direct control and/or programming of CueServer, or use with other 3rd party software that have been written to use CueServer as its DMX interface. After CueServer is programmed, it can function as a stand-alone show controller, leveraging its built-in real-time clock/calendar, astronomical time functions, button and contact closure inputs, and wide variety of event triggers to interact with the outside world. Integrate CueServer with other external devices via RS-232 serial, Ethernet connectivity and more for fully custom lighting and show control solutions.